John Graves: Hear you loud and clear guys. Benjamin Stewart: If Nellie is connected to one of us in Google+, she should be able to hangout. Benjamin Stewart: Just curious, anyone using Linux? John Graves: I noticed this in my men's group the other day -- we all wear glasses. Rob Darrow: Nellie, nice to see you, Sound is good. Benjamin Stewart: yes, audio is good. John Graves: Here in Auckland we had a similar setup for multicampus meetings -- wall sized. What is your local time? 2:24AM here in New Zealand. Dr. Nellie Deutsch Muller: I love apple! I was writing in the chat so much for the breathing, Jeff. John Graves: Not hearing much about SCORM now. Dr. Nellie Deutsch Muller: I just invited people. I'd like to see how . Dr. Nellie Deutsch Muller: anyone using a mac? John Graves: Nellie - I'm on a Mac, using built-in iSight. Dr. Nellie Deutsch Muller: I'm wondering if the camera quality is any better. Benjamin Stewart: Nellie, your video looks fine, just a lot of light in the background. Benjamin Stewart: I haven't setup any circles yet. John Graves: Forced to use IE at Uni. Rob Darrow: Hi Evelyn - Can you see this? John Graves: Attended "iPads in Tertiary Education" yesterday. Dr. Nellie Deutsch Muller left group chat. John Graves: Looking to create more content. Dr. Nellie Deutsch Muller joined group chat. John Graves: 10 people! Very good. Dr. Nellie Deutsch Muller: I left and had a hard time coming back. Kalyan Chattopadhyay joined group chat. Dr. Nellie Deutsch Muller: I cannot delete what I put in the chatbox before I send it off. Anyone else having these issues. Dr. Nellie Deutsch Muller: Eve never gives up. John Graves: Chrome on a Mac. Working well. Benjamin Stewart: I always start with the profile. John Graves: The Google+ page shows a list of who is in the group. Sanford Arbogast: it stems from AOL text chat a/s/l? John Graves: How are you using Reader? John Graves: Found the Google Group problematic. John Graves: Attrition is a big problem. currently using, challenging others to do the same. What happens to the groups after the MOOC has come and gone? Benjamin Stewart: How do you measure that? John Graves: Need a tally of who is in every week. Elena Garofoli: Sanford, how are you finding "Reality is Broken?" John Graves: 70-80 dropped off Moodle. Benjamin Stewart: I like that idea. Dr. Nellie Deutsch Muller: but how many are still there? but who would go through exit door ? this one for week 1? know what determines when video changes? John Graves: Jeff: Best list yet. John Graves: Or years later. Benjamin Stewart: It took me time to find my "groove". Dr. Nellie Deutsch Muller: Elena, is your first MOOC? about EduMooc who is Alex Pickett? Dr. Nellie Deutsch Muller: I'm here to have fun. Elena Garofoli: hey Sanford can you mute your mic? not meaningful, people stop for sure. Benjamin Stewart: For teachers as well. all at the same time. Without this tech, we would not know that. Benjamin Stewart: I like the idea. 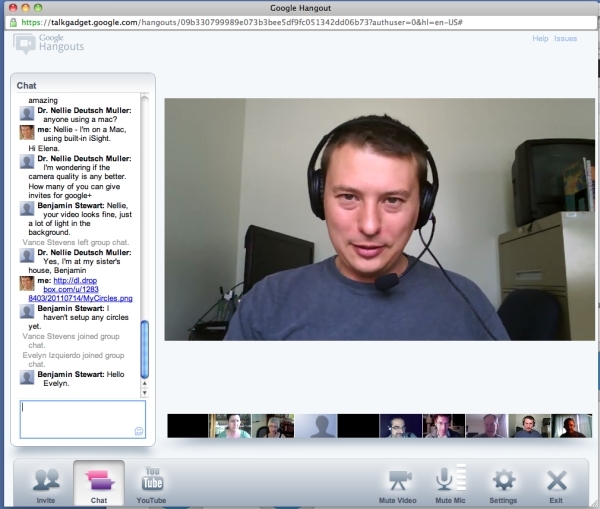 Thanks for uploading our hangout (my first!). 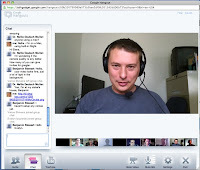 I also was able to get a recording of our meeting, although I did come in a bit late. I'm happy to report that for the first time, I was able to record my desktop (using Tibesti) and participate in a live video/voice chat with not audio issues...and I'm running Linux (i.e., Linux Mint 11) to boot! I've tried on Elluminate, WizIQ, UStream, LiveStream, you name it. Anyway, enjoyed the session and it was great to meet live many of those I follow online.